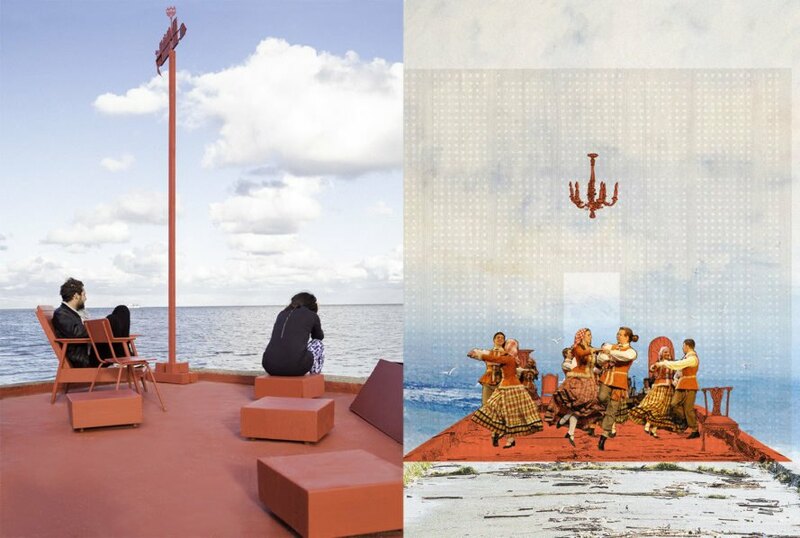 An all-red public living room has popped up in an unexpected place—the end of a pier in Lithuania’s Curonian lagoon. Built as part of this year’s European Architecture Students Assembly, ‘The Living Boom’ is a temporary public space that contrasts the familiarity of a cozy living room with the outdoor environment. The 50-square-meter public living room is painted all red to emphasize the dissimilarity and is made up of locally found and modified Soviet-era furnishings. The Living Boom offers an unexpected and quiet respite in Nida, the bustling popular resort town in Lithuania. A team of 18 international architecture students completed the project within a span of two weeks. 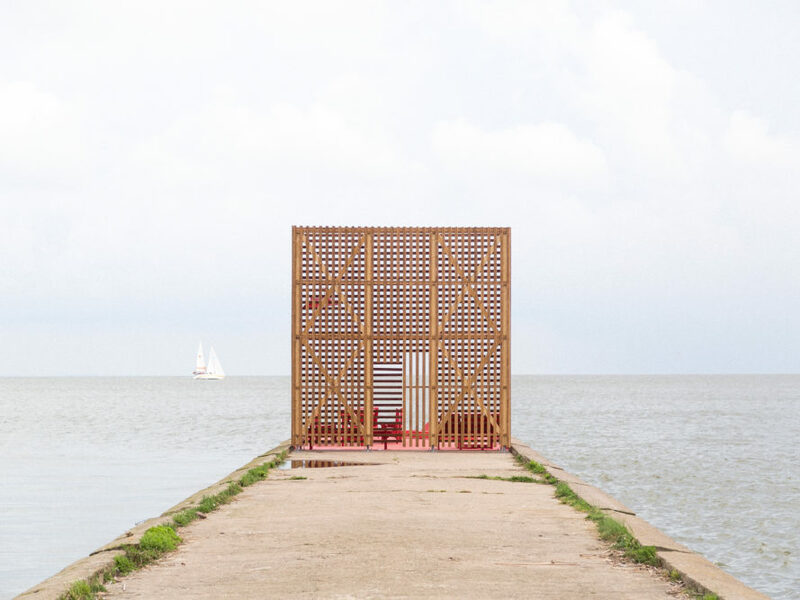 The public space is partially hidden behind a five-meter-tall wooden wall so that visitors must physically walk onto the pier to see the entirety of The Living Boom. The wall, fixed to a concrete floor with metal bolts, serves as the symbolic threshold between the “interior” living room and “outdoor” nature. The Living Boom is outfitted with local Soviet-era furniture modified with modern elements by the students and includes a three-meter-long table, multiple benches, a traditional wind vane, a giant wooden chair, and even a fireplace. All parts of the installation were painted the same shade of red. The Living Boom offers an unexpected and quiet respite in Nida, the bustling popular resort town in Lithuania. 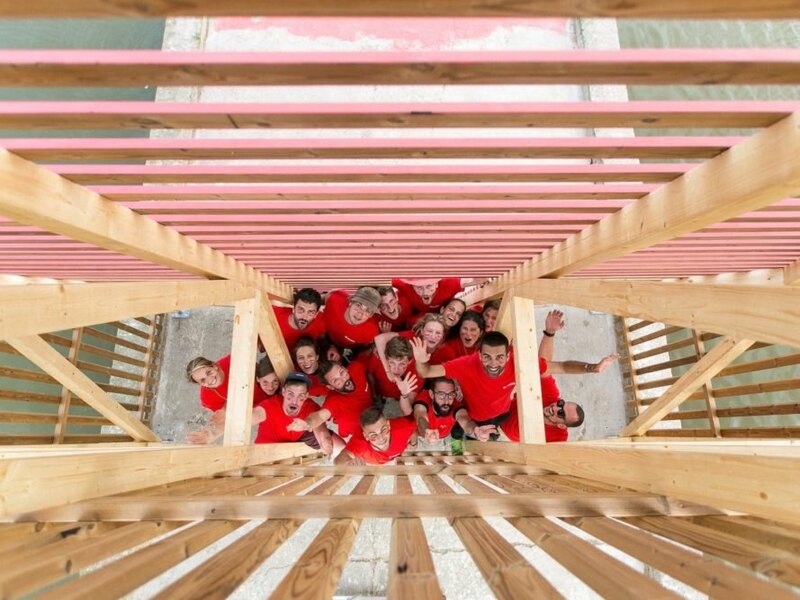 A team of 18 international architecture students completed the project within a span of two weeks. The public space is partially hidden behind a five-meter-tall wooden wall so that visitors must physically walk onto the pier to see the entirety of The Living Boom. The wall, fixed to a concrete floor with metal bolts, serves as the symbolic threshold between the “interior” living room and “outdoor” nature. The Living Boom is outfitted with local Soviet-era furniture modified with modern elements by the students and includes a three-meter-long table, multiple benches, a traditional wind vane, a giant wooden chair, and even a fireplace. All parts of the installation were painted the same shade of red.